THIS TESTING CALL IS CLOSED FOR NOW, THANKS FOR ALL THE RESPONSE!! 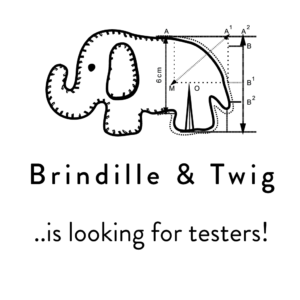 Brindille & Twig is looking for some pattern testers to fill out our team! What does testing look like? Pattern testers will be added to the Facebook testing group so you must be active on Facebook. After we have pre-tested a pattern and written the tutorial we will make a call to the testing group for available volunteers. You will sign up to test a pattern in a specific size, knowing that you can complete it within 1 week. After testing the pattern, you will provide us with any feedback needed. EXAMPLE: fit issues you found, tutorial was unclear at some point, something was mislabeled, a photo wasn’t right etc.. This boot photo is an example of one snapped on a phone but still super cute and can be used to post! No fabrics are provided so this would all be done on your own time and with your own materials. After we receive the testing feedback we change the tutorial or pattern if/where needed and then publish! !